Nvidia Senior Vice President Tony Tamasi says it's no longer possible for consoles to be better graphics platforms than PCs. Let's get this out of the way early: Referring to "the PC" as if it's a standardized piece of hardware is dodgy business. Unlike consoles, PCs come in all shapes, sizes and capabilities, and so when referring to them in comparison to consoles, the general assumption has to be that it's high-end, cutting-edge equipment being discussed. 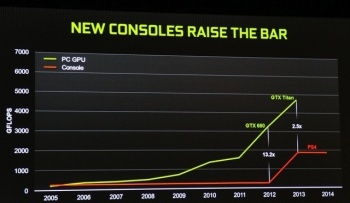 And that kind of hardware, according to Tamasi, will always out-muscle anything that a console can bring to the table. "It's no longer possible for a console to be a better or more capable graphics platform than the PC," he told PC PowerPlay. "In the past, certainly with the first PlayStation and PS2, in that era there weren't really good graphics on the PC. Around the time of the PS2 is when 3D really started coming to the PC, but before that time 3D was the domain of Silicon Graphics and other 3D workstations. Sony, Sega or Nintendo could invest in bringing 3D graphics to a consumer platform." The Xbox 360 and PlayStation 3 were "on par" with PCs when they launched, he continued, because they're both powered by technology from either AMD or Nvidia, which is where all the innovation in graphics is now being done. "Nvidia spends 1.5 billion US dollars per year on research and development in graphics, every year, and in the course of a console's lifecycle we'll spend over 10 billion dollars into graphics research," he said. "Sony and Microsoft simply can't afford to spend that kind of money. They just don't have the investment capacity to match the PC guys; we can do it thanks to economy of scale, as we sell hundreds of millions of chips, year after year." The other limiting factor is simply the power needed to drive the technology. Because the core graphics technology in consoles is the same as in PCs, there isn't going to be any meaningful improvement in efficiency, which means that in order to drive significantly more powerful GPUs a console would require a much beefier power supply. "Consoles have power budgets of only 200 or 300 Watts, so they can put them in the living room, using small fans for cooling, yet run quietly and cool," Tamasi explained. "And that's always going to be less capable than a PC, where we spend 250W just on the GPU. There's no way a 200W Xbox is going to be beat a 1000W PC." Of course, not everyone is going to have a 1000W PSU in their rig, nor are very many people likely to pony up for an Nvidia Titan, which costs literally twice as much as an Xbox One. But in three years, the Titan will sell for a third of what it's currently going for and some new whiz-bang hardware will be perched on the bleeding edge, while the Xbox One will still be an Xbox One.